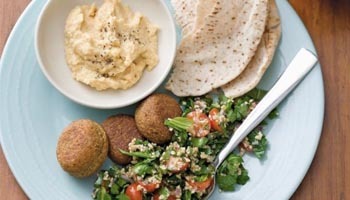 Serve as a side dish, in a pita, wrap or sandwich. Ready-to-mix kit. No chopping or measuring. Just mix bulgur and spice mix with water. Then combine all pre-chopped fresh vegetables and serve. Ingredients: Parsley, tomatoes, onions, bulgur wheat, soybean oil, spices, salt, citric acid. Preparation Instructions: Must be kept refrigerated. Empty spice pack into bowl and add 16 oz cold water. Let stand 20 minutes. Combine parsley, tomatoes & onions, and hydrated bulgur mix in large bowl. Mix and serve. Bring Tabouli Salad to your restaurant today. Contact us or download a spec sheet to learn more.